← One Last Time… Join us on Saturday!!!! The Governor Will Hear Us Roar! Yesterday we asked you to join us this Saturday in Manhattan as we rally, along with 40+ other organizations, for public education. Today we want to make you aware of another important date in the coming week. 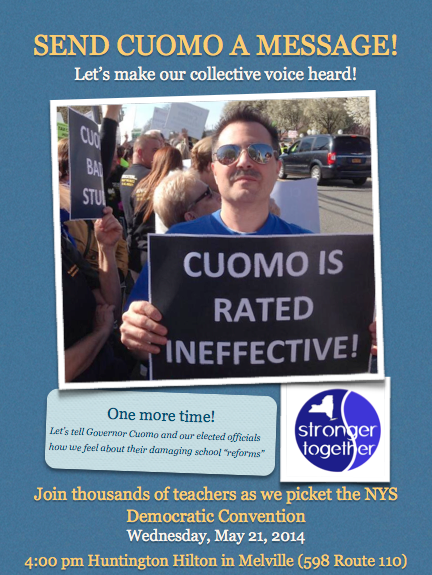 On Wednesday, May 21st we will join thousands of other Long Island teachers as we demonstrate and picket outside of the Huntington Hilton in Melville at 4:00 pm. The Hilton is the site of the 2014 New York State Democratic Party Convention. You will remember that this is the rally the governor asked Beth Dimino and other local leaders to cancel. We assured you the rally would still go on and it will! Let’s let the governor and the other elected officials in attendance know how we feel about Common Core, high stakes testing, junk science evaluations, the tax cap, and the rest of their ed deform agenda! Rob Pearl will be there… will you? This entry was posted in General and tagged Cuomo, rally, Stronger Together. Bookmark the permalink. 1 Response to The Governor Will Hear Us Roar!